Over the years, we have found forever homes for HUNDREDS of pets! All of our animals at Brookdale Pet Center are foster pets looking to be adopted. Each have their own unique stories and personalities. Here are some pets that are ready for adoption! Claire is a sweet young female guinea pig who was born in October 2018. Claire is an abyssinian guinea pig, so her fur looks scruffy and sticks up in places, giving her a cute bed head look. She has a beautiful chocolate brown, tan, and white coloration. Claire was brought to us after her owners developed allergies to her shortly after adopting her. Claire is very friendly and loves to be brushed and cuddled with. She would make great family pet or companion for another female guinea pig. Angus is a male guinea pig about 2 to 3 years old. He was brought to Brookdale Pet Center because his owners were moving away, and could not take him with them. He is absolutely adorable with his rex fur, making his coat very soft and fluffy. He has the cutest little face and has a great personality to go with it! Angus is very comfortable being held and petted and would do great as a family pet and/or paired up with another compatible male guinea pig. Stetson is a handsome male guinea pig with a long, scruffy black coat. We estimate he is around 1 to 2 years of age. Evidently, he was left in a dirty cage at his previous home and had mats in his fur. He is feeling much better now that his fur is brushed and he has a nice, clean place to sleep. He seems appreciative of this, and has started to come out of his shell. He is shy around new people but we are working to show him that there's nothing to be afraid of. Charlotte is a young female rabbit who was brought to us after she was found abandoned in a park in very cold weather. She had been left in a small cage with the door left open, but she was too scared to leave her cage. Shortly after arriving at Brookdale Pet Center, we quickly noticed her sneezing and coughing. With the help of our vet, we found that she had caught a cold. Charlotte was extremely cooperative taking her medication, and she is now healthy and ready for adoption! Tipsy is a female baby abyssinian guinea pig who was born in November 2018. She was brought to us along with Claire, although the two are not related. Their owners developed allergies soon after adopting them and unfortunately had to rehome them. Tipsy is still quite small, but would would pair well with another female guinea pig around her age. She loves to be held and cuddled, and often likes to bury herself in hay when she sleeps! COFFEE & TOAST - ADOPTED! Coffee and Toast are a bonded pair of dwarf rabbits who are both around 3 years old. Coffee, the darker colored male, is neutered so there's no chance of any accidental pregnancy between this male/female pair. Toast, the lighter colored female, has a little bit of the "lionhead" gene, which is shown in the mane-like tuft of long fur that grows around her head. These two bunnies get along very well together, and must be adopted as a pair. They can often be seen sleeping or eating side by side, and spend a lot of time grooming each other. Grooming is a big part of how rabbits show affection for one another, making it a great way for owners to form strong relationships with their rabbits. If your rabbit tries to "groom" you in return, that means they are very loving and trusting of you! So come on in and share the love with Coffee and Toast! PIKA & BOO - ADOPTED! Pika and Boo (Peekaboo!) are two very sweet young female guinea pigs estimated to both be around one year of age. These two girls were discovered on arrival to have fur lice due to being left in a filthy cage. Guinea pig lice are only transferable to other guinea pigs are are NOT contagious to people. Nevertheless, Pika and Boo were placed in a quarantine cage where we treated them thoroughly with medication. Now that they are lice free, these girls are finally ready for adoption! They are both a little bit shy but they will come running if they see that you have food to offer them! 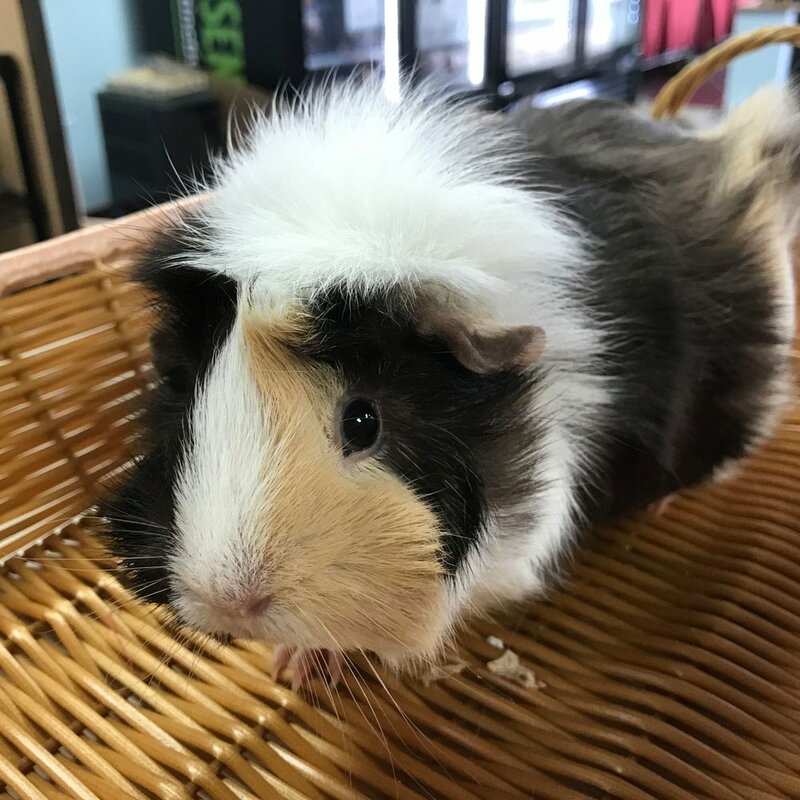 They are bonded and get along very well, so they would be a perfect choice for anyone who is new to keeping guinea pigs, as bonding them can be difficult. Louie is a 4 year old neutered male rabbit with a rather special coat. His fur is called a "rex" coat because the fur grows shorter, thicker, and softer than normal rabbits. And in Louie's case, he has what is also called "chinchilla" fur because of its two toned gray color that is characteristic of chinchillas. He is velvety soft and gets a lot of petting and attention because of it! He was given his name after a customer described him as the "Louis Vuitton" of rabbits, due to how soft and luxurious his fur feels. Louie is very calm and will gladly sit still while he gets pet and brushed. He's got a wonderfully friendly personality and will be a great pet for any family. JILL AND SAMANTHA - ADOPTED! Noel is a year and a half old albino female rabbit with a beautiful snowy white coat. She has a very sweet and calm disposition and is comfortable being picked up. She loves attention and will lay down her head to ask for some petting. She arrived to us along with Holly, but as far as we can tell the two of them are not related. Noel would do great as a family pet and loves the affection of children and adults alike. Pepe is a young lionhead dwarf rabbit who is about 1 year old. He was named after the famous skunk character due to his black/white coloration with a white stripe on his face. Pepe also has beautiful blue eyes, a trait that is uncommon in rabbits of his color. His lionhead characteristic means that he also has a "mane" of longer fur around his head. He is very calm and has a very sweet personality to go along with his good looks! Slinky is a young female ferret (already vaccinated and spayed) who was born in January 2018. Because of her hilariously curious and friendly personality she is absolutely adored by customers and staff. Slinky loves nothing more than to be held and pet, but once she gets excited, she will tirelessly chase her toys around, and will jump and run and wrestle like a puppy. Ferrets are notoriously mischievous and will get into anything that catches their interest. However, ferrets are also very heavy sleepers, and when they aren't playing and exploring, they are busy napping. Ferrets are very social, and prefer to be kept in pairs. Slinky was given to us as a single ferret, and we request that whoever adopts her also finds her a cagemate. Come on in and spend just a few minutes with slinky and you will surely fall in love! Bumble is a male abyssinian guinea pig who is reaching a more senior age at about 4 or 5 years old. He was in rough shape when he first came to us. The bottoms of his feet were red and irritated from being left in a filthy cage. His skin was also very dry as a result of this and he was shedding heavily due to a vitamin deficiency. Fortunately, all he needed was some TLC, a clean cage and good diet. He recovered very quickly and is now in perfect health. Bumble is very mellow and sweet, partly due to his age. He seems appreciative to be living a better life, and hopefully will get to be a loving pet to someone once again. Holly is a year and a half old female rabbit. She has a very special coat called "rex" fur, which is extremely soft and has a velvety texture. The unique rex fur also makes her whiskers short and curly. Holly is very friendly and comfortable with being held. She is even known to nudge your hand with her nose when she wants to be petted. She was brought to us along with Noel, from a situation where the owner had too many rabbits to take care of. Garnet is an adult bearded dragon with a mellow and sweet personality. She spends most of her time relaxing and sunbathing on her hammock. And there's nothing she loves more than soaking in a nice warm bath! Unfortunately, not all of Garnet's life has been easy, and due to improper care prior to being brought to Brookdale Pet Center, she has a few health issues her new owners will have to help her with. Bramble is a one year old male guinea pig with a cute scruffy coat. He came in with a cage mate who was adopted out separately, so he would be a good candidate to pair with another male guinea pig, as long as they get along well and are bonded properly. He is very sociable with people as well and has a calm and friendly personality. His long fluffy fur will need some occasional brushing, as when he first arrived at Brookdale, he had a couple of mats in his fur. Specks is a 3 year old neutered male dwarf rabbit. He is extremely friendly and calm, and would do great with any family. He is always eager to be pet and will often lay down and close his eyes when petted. He is very tolerant with being held as long as he feels secure. On occasion he can become nervous and shy when there is a lot of loud noise and activity going on, but a few scratches behind the ears and he comes right out of his shell. Sasquatch & Yeti are adult brother guinea pigs who were brought to us after being abandoned at a vet's office. They both have abyssinian fur that sticks up and gives them an adorable bedhead look! After arriving at Brookdale, we found they were quite shy around people but seemed to find comfort in each other. Since then, they've been learning to trust people, becoming more comfortable being held and brushed, which is necessary to keep their special hairdo's soft and tidy. As a bonded pair, they love to snuggle each other and keep in close quarters. They're a perfect pair for those who are new to keeping guinea pigs, as bonding males can be rather difficult! Jack Jack is male baby hamster who was born in June 2018, and is the sibling to Clementine. Since he came to us, his fur has been growing out quite a bit, as the long haired teddy hamster genes are kicking in! He has soft fluffy brown coat and an energetic personality. Along with his sister he was born from a female hamster who was bought from a corporate pet store, unkowingly pregnant when she was adopted. Thankfully, all of the babies were born healthy, and have grown into wonderful pets. Jack jack is looking for a forever home with a family who will give him lots of treats that he can stuff into his cute little cheeks! Tango is a 2 year old female leopard gecko with a "high yellow" morph pattern. She is fairly comfortable with being handled and loves to eat wax worms, horn worms, and crickets on occasion, as she can be a lazy hunter sometimes! She chills out in her cave most of the day, sometimes with just her head poking out of the entrance. But in the evenings she can be seen taking a leisurely stroll around her tank. BUFFY & WILLOW - ADOPTED! Buffy and Willow are two adult lop-eared rabbit sisters who are very much attached to one another, and must be adopted together as a pair. These girls are extremely affectionate and love to be pet and snuggled with. They are often found sleeping side by side and even share meals without any conflict. Although we've caught willow trying to sneak food out of Buffy's bowl from time to time! They are both very calm and sweet rabbits and would do wonderfully with any family who can provide them with some extra room (like a play pen) to accommodate both of them. Harper is a one year old female dwarf rabbit with a feisty personality. She is territorial over her cage and belongings, and is especially protective of her toy ball which is her prized possession. She needs an owner who is understanding of this and has the love and patience to earn her trust. When she is outside of her cage, however, she becomes much more relaxed and is just as happy to be pet and held as any other rabbit. Sierra is a one year old, female leopard gecko. She was abandoned with Tango because their owner could not care for them. Her unique coloring is called a “blizzard” morph that gives her a vibrant purple hue. She always demands attention as soon as the sun goes down, and will come out of her hide to ask for play time! Rango is a one year old bearded dragon. He is slowly learning to trust people with being held and is becoming more and more social. He can often be seen sitting on his hammock slowly waving his front hands at us, which is seen as a peaceful sign of greeting among bearded dragons. Rango is a talented hunter of crickets and sports a beautiful pattern of spots on his back and belly. Jamie is a 4 year old dwarf lionhead mix rabbit. She is extremely mellow and loves be to groomed and petted, making her great with children. While some rabbits want to run and jump around, Jamie is the kind of bunny that would rather just hang out on someone's lap and be petted, although she wouldn't pass up and opportunity to explore around (at her own leisurely pace of course)! Ferdinand is a 4 year old male guinea pig who came to us because his previous owners developed an allergy to guinea pigs. He had another male cagemate that passed away from illness, and loves getting extra attention from the people around him. Bluebell is a female rabbit of undetermined age that came to us through a local shelter. She had been left on their doorstep in a dirty carrier. Despite this, she is extremely friendly and will run to the edge of her cage to be pet. Cinder is a 1 year old guinea pig who came to us with her sister, Soot, through Bloomfield Animal Shelter. Soot unfortunately passed away, but Cinder is ready to give just as much love as two guinea pigs to her new family! Clementine is a female hamster baby who was born in June 2018, and is the sibling to Jack jack. She is a mix of a syrian short hair and a teddy long haired hamster. Her mother was adopted from a big-box store, and as is common in hamsters bought from corporate pet dealers, she was unknowingly pregnant, and gave birth to a litter of babies. The owner contacted us to help her rehome some of these furry little dumplings, and that's how we came to meet Clementine and her brother. She is well socialized from being handled since she was very young, and would be a great low-maintenance pet for any family. Bowser is a very lucky bearded dragon. He was found by a local animal shelter after being lost on the streets and was in pretty rough shape. With the help of the shelter, and our vet Dr. Krausman, we were able to nurse Bowser back to health. While regaining his strength, he quickly started to show his surprisingly spunky and increasingly energetic personality. Despite missing a few toes and one of his back feet, he is determined to climb and run just like any other lizard. He is a wonderful companion to humans and is a very special dragon with a zest for life. Big Gail is a 3 year old female leopard gecko with a classic and beautiful leopard morph pattern. She has an especially fat tail, which is a sign of a happy and healthy gecko. She is a great hunter, and will never turn down a tasty bug dinner. Gail is also very comfortable with being held, and will even hold on to the front of your shirt and climb up to your shoulder to hang out with you (and probably to also enjoy soaking up your body heat). Dipper is an adult male guinea pig who came to us as a rescue from a very sad situation. He was found abandoned in a small glass fish tank inside of a dumpster. We have no idea why anyone would throw away such a sweet and innocent animal. It's a reminder of how important it is for us to take in these abandoned and mistreated pets, and how rewarding it is to be able to give them a second chance. From day one Dipper has been incredibly affectionate and trusting towards people. He constantly wants to be held and will cuddle into your arms. He is a laid back guinea pig who would do very well with any family who is willing to give him lots of love! Cole is a cute young guinea pig who is about 7 months old as of this July. He is extremely affectionate and enjoys getting rubbed under his chin and behind his ears. Cole absolutely loves taking naps all curled up like a cat and adores cuddling with people. He is all around a sweet little pig who would do great with any family that will give him lots of love, as he can be a bit of an attention hog!